Clutter is distracting, especially in a small space. Several larger, well-placed accessories have much more impact than a myriad of chotchkes. 2. Don't be afraid of color. Warm vibrant color defines a small space more distinctly than pale tones and brings a small room into focus. 3. Resist the urge to purchase the loveseat along with the sofa just because they match. Buy a chair with the sofa instead. Most of the time only one person will sit on the loveseat anyway. To have correct placement in the room, the loveseat needs to be arranged in an L-shape with the sofa. Used in a different home with a smaller room, both pieces may not work together and they may end up at awkward angles in the room. 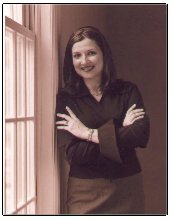 For interior design help in your size-challenged rooms, contact the small room specialist: Tammy Comino, Pittsburgh Interior Designer.